It’s time to celebrate Math! September is Mathematics Awareness Month. In celebration of this activity, the Math committee planned several exciting activities for our preschoolers. The chairman for each level created different classroom-based activity: Miss Yolysil S. Motol prepared the “Pizza Making” activity for the Nursery Level, a “Number Match Wheel” headed by Miss Daina C. Palanay for Kindergarten Level and the “Dice Making” was supervised by Miss Maria Allin M. Purificacion for the Preparatory Level. The said activities were conducted in their respective classrooms. 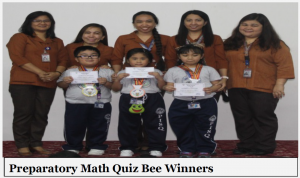 One of the high-lights of Math activity was the Math Quiz Bee. Its elimination was held last September 24, 2017 wherein all pupils took the elimination test. 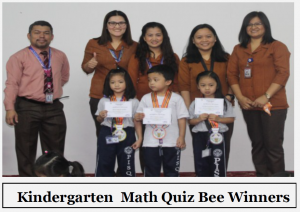 The pupil with the highest score represented the class for the Math Quiz Bee. 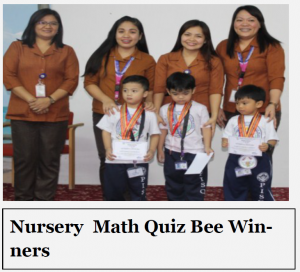 The Nursery Level had seven (7) contestants, ten (10) for the Kindergarten Level and eight (8) contest-ants for the Preparatory Level. The following winners received Ribbon and Certificate of Recognition during the Culminating Activity at the Corniche Hall in their respective level.